A well spent weekend - Off Topic - Drive On Wood! Well fellas, all your marvelous dating advice must’ve rubbed off. 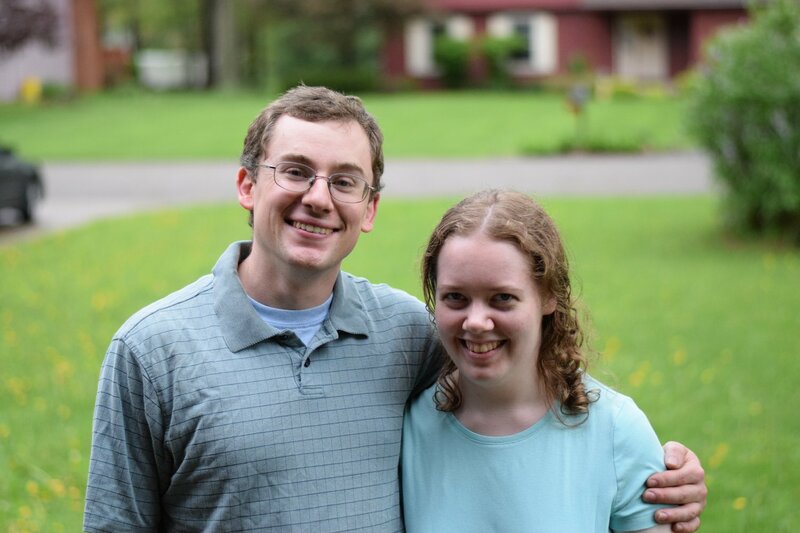 I’m pleased to announce that I am now engaged to this fine young lady, Mary Kerr. I will tell the whole story in this thread. But for now, suffice it to say this. Most of you probably think I have high standards. You have no idea… In this world of online dating, I filter out 99.999% (yes 5 nines) of everybody within about 30 seconds. I have viewed something like 5,000 dating profiles in the last 3 years, and talked briefly with 4 or 5 of those. Honestly given the numbers I had my doubts about finding anyone that way, and was seriously looking for alternatives. In all those thousands, only one made me sit bolt upright. I knew from that first 30 seconds, that I’d marry her if she’d have me. The rest was just following through, doing “due diligence”. We talked for about 3 weeks. And, after driving 6 hours to meet her, we both knew. There was no reason to wait, and I’ve never been happier. This story starts in 2015. I was heavily into woodgas, living and breathing it (not too much!) and making awesome things out of steel and wood. At some point, I realized that as fun as woodgas is, it wasn’t getting me much closer to my goal of being happily married, raising a family on a farm. So I split that problem in half, and tackled each separately. I dropped out of sight on DOW, kept my head down, and pursued both projects in parallel. You can see the homestead project over here. Plus, I had to actually like this person, and get them to like me. I consider this a “normal” person, as I consider myself. Normal is not the same as common. I think 100 or even 50 years ago, there were a lot of folks that would fit the above list, even aspired to it. Today, a “normal” person is very uncommon, and I promise you the ones that exist don’t usually frequent online dating sites. I think many of them may be Mennonite or Amish… And that is a road I did not care to travel. I tried eHarmony, OKCupid, and FarmersOnly. OKCupid is the biggest of the bunch, because it’s free. Unfortunately that’s the biggest problem with it. The whole world is there and none of them are very much like me. Most of the crazies / ultra liberal / gender bender types are on there too, and I raised my eyebrows more times than I can count. There is an extensive questionnaire section, but they ask a lot of foolish questions that aren’t exactly helpful. I racked up around a thousand of them, and it got me exactly nowhere. eHarmony is full of nursing students and lady lawyers who have money but no time to work on their social lives. No problem finding well educated folk, but as for the family/kids/farming bit, not much interest there. The much touted matching algorithm is complete BS, I did better at OKCupid. This one I actually paid for, unfortunately. I discovered FarmersOnly by accident, but it was the most successful (and where I eventually found Mary). It does a lot of pre-filtering for you, because it is super clunky, and is more or less seen as a “joke” dating site. But because of the name, actual rural people show up there in droves. They are also predominantly white, conservative and Christian. Prefiltering! The only problem is the nature of modern rurals. Gone are the hardy farm folk who built this country. Now, most of them are overweight trailer dwellers, who claim to love to ride ATVs, and go fishin and drink Bud Lite around bonfires, get tattoos, and go mudding in a big truck, blasting out Hank Jr. That’s the extent of their “country” life. The other unfortunate thing is the huge number of single mothers there, again a common modern rural situation. I started feeling bad for them, there were so many, so young. Because of the poor '90s style website design, I had to load each profile page just to get an idea of who it was. This is the bulk of the thousands of profiles I mentioned, simply because there are no good filtering mechanisms on this site. I got very fast at it, usually faster than my internet connection. About 1% of them I would save off and later send a message, but only a few of those actually responded. 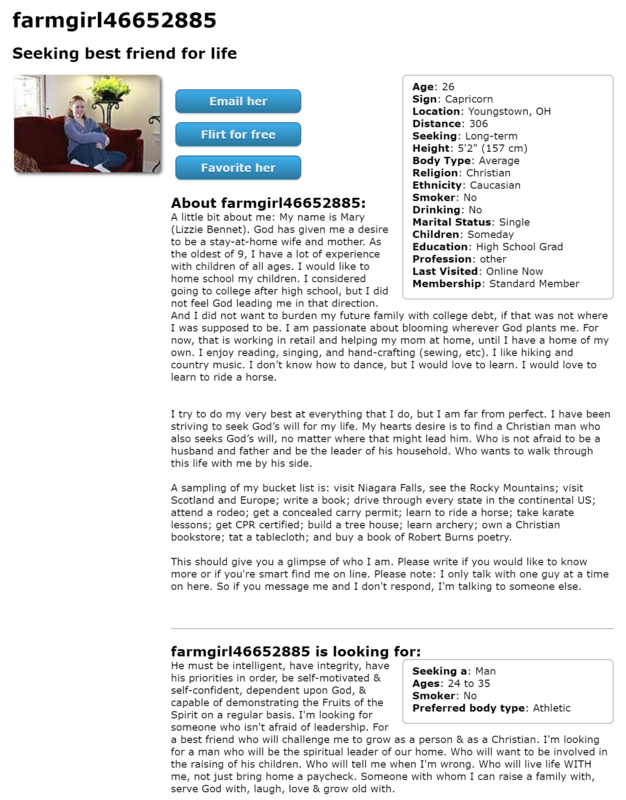 As it turns out, profiles on FarmersOnly are actually mostly ghosts. The site got very popular for a couple years via a very good marketing campaign. It has slowed down a lot now, but since they never delete inactive profiles, or even mark them as such, you have no assurance that a person exists. Eventually I got the premium membership, which lets you see how long it’s been since someone visited, and of course message them. That speeded up the filtering even more. I paid for a 6 month subscription twice. I let it run out once, took about a three month break, and then got back in the saddle for round two. I wasn’t going to renew a third time. Mary told me hers was expiring about 3 days after we started talking. Mine expired about a week after that. Some timing, eh? I am glad I never have to use a dating site again. I don’t recommend it, unless you are as ruthless and determined as I was. Even still, finding Mary that way was a miracle. Wow. This is a girl I need to talk to… NOW. I immediately sent her a message. At first I got no reply… As it turned out, because I had at the time listed that I was only looking for people within 200 miles, and she was closer to 300, she didn’t take a serious look. Once I realized the problem and removed that, she noticed, and wrote me back. We started talking at length and I realized I had struck gold. 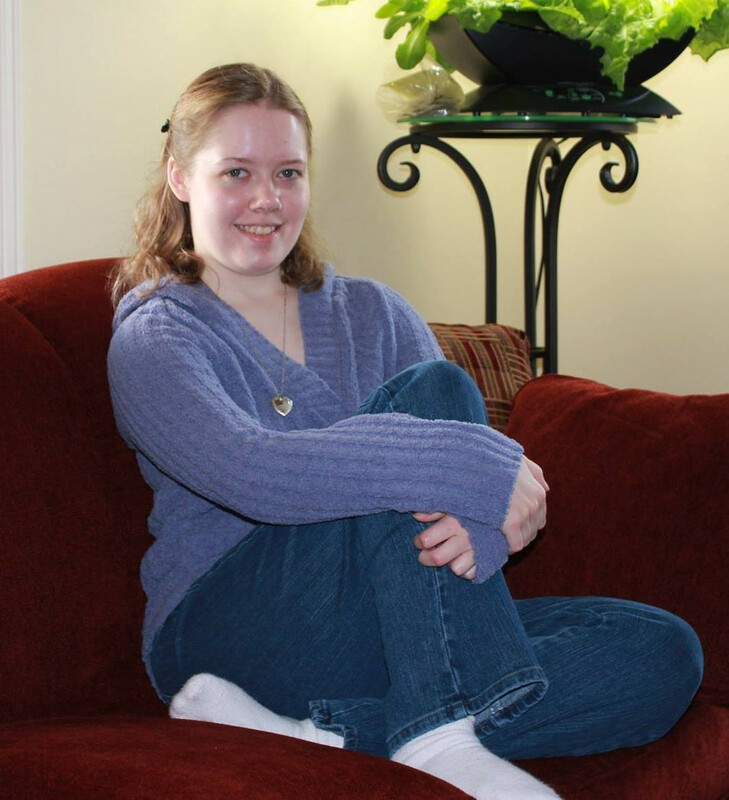 Mary Kerr is 27, the oldest of 9, and homeschooled. Her family has lived in Pennsylvania, Vermont, and Ohio. Her Dad is a computer programmer and her Mom used to teach math. Our two families are extremely similar, which still surprises me a bit… I didn’t think there were any other families like ours. Ha! She loves hand crafts and homemaking, and wants to homeschool our kids. She loves books and is very smart. Quiet and reserved, but with a sparkling wit and knows when to tease. She is a Christian and has the same outlook on life as I do. We both have the same goals and dreams. In fact we have yet to find anything we seriously disagree on. We both like to live simply and are very frugal. Even the simplest things seem to be fascinating to talk about. Our running joke is that we’re both very boring people, and we like it that way! Mary has never done any farming or gardening, so that part will be a learning experience. She’s ready and willing, but hasn’t had the experience. I’ll make a country girl out of her yet. She is already pretty handy with household repairs, which is a pleasant surprise. We both have a lot to learn about house building in the coming years, starting with a full remodel of the existing house on our homestead (see the homestead thread here). So, after talking to Mary for a couple of weeks, and finding there were no roadblocks, I decided to make the trek to Ohio for a visit. After all, meeting the family (and the girl!) seems kinda important. I drove 6 hours north early on April 14th, a Saturday morning. We played some Scrabble, went to the park, and talked for several hours. Sunday I took her out for some ice cream. 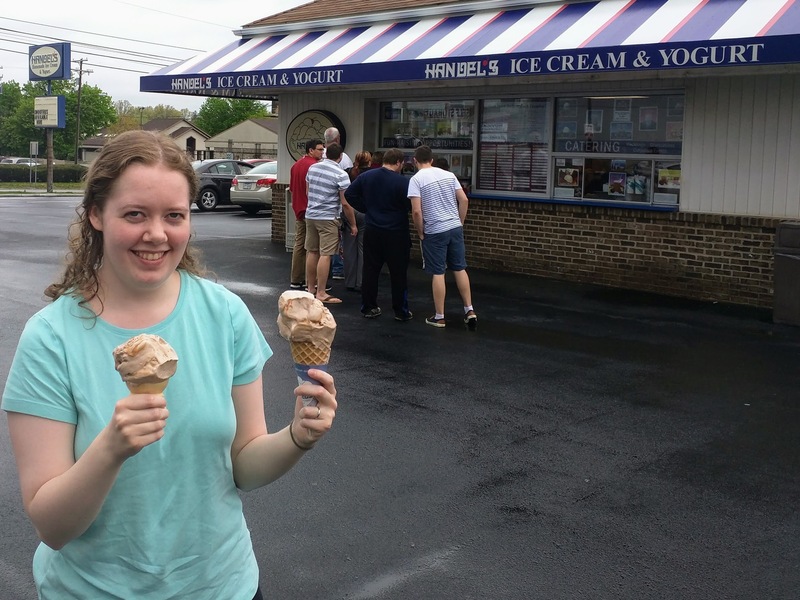 Handel’s is actually world famous, and happens to be right down the street from her house. As we sat in the car and finished our peanut butter parfaits, I asked her if she would marry me, and she said yes. Now, this was the extent of my planning so far… I hadn’t even gotten a ring yet. 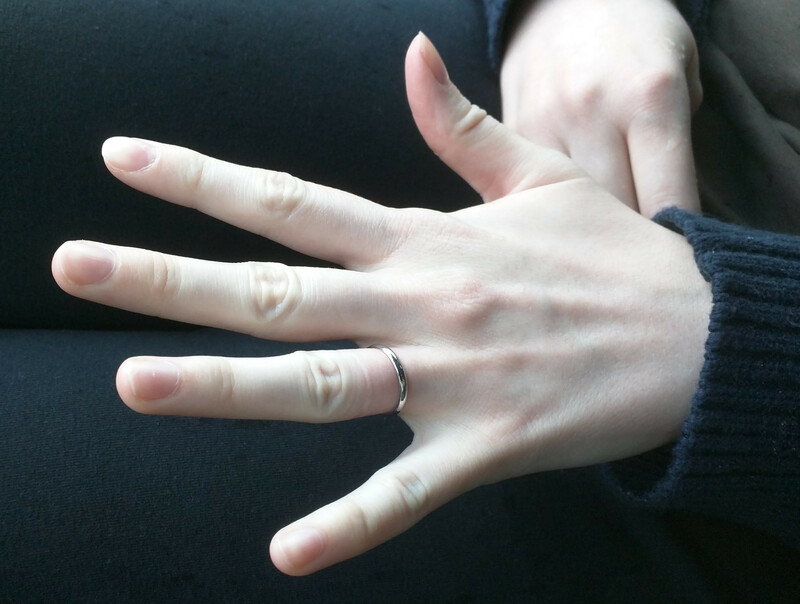 So I found a red rubber band in the console, and put it on her finger. We decided to head over to a jewelry store and pick out a ring. I let her take the lead, since a) it wasn’t a surprise anymore, and b) I know nothing about jewelry. As you walk into these places, the sales folks descend on you like bloodsuckers smelling fresh meat. The nice man started pointing out all the shiny diamond rings, and asking lots of expensive sounding questions. And then Mary said, “Do you have anything without any stones? I don’t really want a stone.” You should have seen the look on that poor man’s face… crestfallen, he pointed us towards the back corner of the store, where the “men’s” rings were. Apparently men get to have simple rings. She picked out a thin, plain silver band. She has small hands, so the ring was not very big either. I asked her if she was sure that’s all she wanted, and she told me it would be more comfortable and she didn’t want anything fancier. So we walked out with the cheapest ring in the entire store, and I couldn’t have been happier. Not because I saved a bunch of money… but because I found someone who (like me) didn’t crave expensive things. At this point we headed back to tell her folks, and I was expecting a bit of shock on their part. After all, I proposed only one day after meeting Mary for the first time… But as it turned out, they were actually placing bets on whether I would propose Saturday or Sunday (Mom won the bet… she’s very smart). Apparently my intentions weren’t so hard to figure out. I then got in the car and headed straight home… Work on Monday and all that. But, overall, a well spent weekend. Over the following week we decided to get married at the end of June. Neither of us wanted a long engagement, and we’re both the type to wait for marriage, so… what’s the point in dragging things out? The main reason for June and not earlier was that my sister is currently hiking through Scotland, and we wanted her to be able to attend the wedding. Because of the short timeline, and also both our preferences, we planned a very small wedding, immediate family only (two large families though!). Mary made her own wedding dress, and we found me a perfectly good suit coat at Goodwill for $7. As you can see, the tone has been set. I like it. I have since told lots of folks our timeline, and gotten every reaction from “Wait… what?” to “Are you insane? ?” to “Good work, we did it in 3 weeks too” I find that it reflects more on the person doing the reacting than it does us. So, what are our plans going forward? I’m writing this on June 14th. I have made 3 trips to Ohio so far and am headed up again tomorrow. Each time I’m bringing a load of Mary’s stuff home with me. In about two weeks, we’ll be married. We’re heading to Colorado for the honeymoon, it’s beautiful there this time of year and since we probably won’t get to travel much in the future, we’ll take the time to do it now. After that, she comes to live with me in Frankfort, in the apartment at my folks’ place. We are already working on the little house on the land I bought, and once it’s ready to live in, we’ll move in. Once we’re settled on the farm and have rebuilt the cash reserves a little bit, I plan to start working on the “big house”. More details on this will be posted on the homestead thread. This will be our house for the long haul, designed to hold a big family and be a community hub, for future households sharing the same land. I will be building it in my spare time, meaning we need to be comfortable indefinitely in the little house. So, I will put more work into the remodel, making it nicer than I would otherwise. In the short term, Mary won’t have much to do all day, so she may end up working with me here at Earth Tools. We need some office help pretty badly, she’s well qualified, and the extra income will help power through that mortgage. Longer term, once kids come along (and they will) she immediately transitions to being a stay at home mother. For my part, I will continue to work here until either a) I have mostly paid down the land, or b) one of my side ventures really takes off. Homestead work will happen around the edges, but I should be able to fit more and more of it in, as I am able to back off the hours at work. In the very long term? Who can say? Only one thing I can say for sure. Whatever happens, we are both 100% committed to making this work. Divorce is not an option. Maybe that sounds naive, or old fashioned. But it’s how we both feel. That commitment is real, and makes this a very different relationship than most you will see today. A fair warning, Chris may have an addiction. Yep, it’s to wood gas. Congratulations Chris! Will you be bringing her to Argos to meet your extended family? I don’t know if she’ll make it this year, but it will happen eventually yes. Congradulations chris, hope your newly wed bride and you can work out for the teem effort, Since i been single most of my 59 years i caint be of much guild for marage, though i like the ways you filter the dateing sites.God Bless your famley life. All the best wishes Chris . Congratulations Chris. I commend you on your search criteria. Does she meet most of them? Blows them away, Don. Blew me away too. Congratulations are definitely in order. There is NO adventure that compares to raising kids. Ok thanks for correcting mi time line. We both agree her poised picture shows someone who is “comfortable in their own skin”. This is very important. Some take decades to learn this. If ever. Plus the upper corner greens arrangement looks to be practical edible too. You two strike me now as not being time wasting-away youths. Thanks Steve. Yes, edible greens, good eye. She loves salads. I also agree with your assessment. No worries about us wasting time. We met, visited, got engaged, picked a ring, resized it, and I headed home… in about 30 hours.